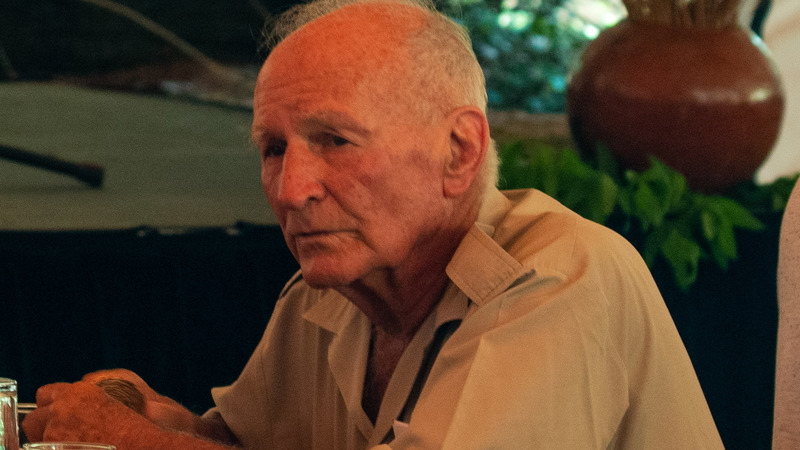 Ted Reilly was familiar to me long before I actually met him; as one of the legendary figures of wildlife conservation in Southern Africa; spoken of with respect and reverence alongside other greats like Ted Davison, Ian Player, John Hanks and Clive Stockil. Just as Ian Player is credited with almost single handedly saving South Africa’s white rhino population, so Ted Reilly is regarded as the father and icon of conservation in Eswatini (formerly Swaziland). Ted has worked for decades to conserve existing animals and reintroduce those which had gone locally extinct – thanks to his efforts, 22 species of mammals have been reintroduced to Swaziland, from the blue duiker to the elephant. His efforts have enabled generations of Swazis to enjoy their country’s wild areas and wildlife. To visit Eswatini’s Mlilwane Wildlife Sanctuary, one of Ted’s creations, is a revelation. During the week, bus loads of local Swazi school children are brought in to enjoy this wild space; at weekends Swazi families and young couples come for a day out; to cycle, walk and picnic. By comparison, the number of foreign visitors is small. This is in stark contrast to most other wildlife reserves in Africa. One of the most depressing things about visiting wildlife reserves in most African countries is that so few of the visitors are from the local population. Whether it is the cost of entry or just indifference, this does not bode well for the future of Africa’s wildlife. I do not doubt the commitment of those working to protect and conserve it, but if those living alongside Africa’s wildlife see themselves as being excluded from a portion of their own country because it has been designated as an area for photo-tourism, and the cost of entry is beyond their means, they are unlikely to embrace conservation. The only other African country where I have seen domestic visitors to wildlife reserves outnumber the foreigners is South Africa. Yet, rather than being hailed as a country that has managed to engage its population in the conservation effort, it is lambasted by many as ‘not the real Africa’. If it wasn’t so sad it would be funny; foreigners – all wildlife experts of course – from Europe and the USA telling Africans that their country is ‘not the real Africa’. It seems that for them countries that are forging their own path and taking control of their own destiny are not the ‘real Africa’. To them the ‘real Africa’ is not a thriving democracy, confident to make its own way, it is rather an Africa they can bend to their will, dependent on foreign aid and willing to be told how to manage their own country and its wildlife. Haven’t we learned anything from centuries of western exploitation of and interference in Africa? Surely we are long past the time when this kind of patronising approach to Africa is acceptable. ‘Real Africa’ or not, the success of wildlife conservation in Southern Africa is very real. Southern Africa operates under a model where wildlife has been endowed with private ownership and its commercialization has been legalized. The result in South Africa is that the numbers of wild animals has increased 20 fold in the last 50 years, while natural conserved habitats designated to conservation have increased 3 times. There are today more wild animals on private land than there are in National and Provincial Parks collectively. By contrast Kenya, Africa’s perceived iconic wildlife Mecca, has lost 80% of her wildlife estate over the same period of time after banning commercialization and consumptive use of wildlife. Anyway, I digress. Back to Ted Reilly. The opportunity to meet Ted Reilly and hear him speak came when I was invited to attend the launch of a campaign by Eswatini to persuade those attending the next CITES conference, scheduled for May 2019 in Colombo, Sri Lanka, to lift a 41 year ban on the trade in rhino horn. In a packed marquee that brought together members of the Eswatini government, foreign ambassadors, local businessmen and rangers from the country’s wildlife department it was abundantly clear that there was one man who commanded the respect of everyone present. Ted’s presentation was eloquent and forceful; there could be no doubting his passion and commitment to see an injustice put right. This campaign is not Ted’s alone, he enjoys the whole-hearted support of Eswatini’s Head of State, His Majesty King Mswati III, Ngwenyama of the Kingdom of Eswatini. It is this level of support that has enabled Eswatini to achieve the finest anti-poaching rhino conservation record in Africa and Ted is quick to acknowledge that the single most essential ingredient necessary to contain poaching is political will at Head of State level. In 1960 there are said to have been 100 000 black rhinos in Africa. The CITES ban was imposed in 1977 and now, 41 years later, despite the CITES trade ban – which was put in place to protect them – there are now 5 000 black rhinos left in Africa. Currently more than 1 000 rhinos are being killed annually by horn poachers. So the ban is clearly not working and the illegal trade continues. So does the slaughter of rhinos that feeds it. The enormous decline of Africa’s rhinos has occurred in spite of the billions of US dollars donated by generous donors to NGOs which have been set up to save endangered species. Another inescapable fact is that conservation is an expensive business, very expensive indeed. Protecting rhinos is prohibitively expensive and is becoming too costly and risky for many custodians to continue doing. Yet some conservation agencies are sitting on the most valuable self-renewing resource on earth which they are prevented from utilizing by CITES. This resource is rhino horn. Rhino horn can be harvested sustainably on an ongoing basis without killing a rhino, because the horn keeps growing even after harvesting and its removal from the rhino is painless. Rhino horn is worth around 60,000 US Dollars per kilogram on the black market, where to obtain it, the rhino will die. But it has no legal commercial value at all because legal trade in horn is banned. This is both tragic and entirely avoidable. A rhino does not have to die for its horn to be removed legally, and repeatedly. The average horn weighs approximately 4kg giving it an illegal value of 240,000 US Dollars. This makes a dead rhino far more valuable than a live rhino and gives criminal organisations a monopoly on trade. That is how nonsensical the ban on horn trade is. As things stand, criminals take all the revenues from rhino horn – and the rhinos have to die, while custodians pay all the costs of protection, with no prospect of earning revenue to offset their costs. This has resulted in some 300,000 hectares of habitat formerly available to rhinos being withdrawn from rhino conservation, because the cost of keeping and protecting them has become too risky and too costly. It is fashionable now, in trendy conservation cliques, to dismiss these great men as yesterday’s heroes, effective in their day but out of step with modern conservation. The debt that Southern Africa’s wildlife owes these men cannot be dismissed so lightly, no matter how much it would suit some of those who would rather fire up your emotions with rhetoric and propaganda than work with proven facts. These people, who argue that a legal trade in rhino horn; one that would ensure that Africa’s remaining rhinos are worth more alive than dead, would encourage the illegal trade; who argue that to legalise rhino horn as a commodity would reduce rhinos to the status of a farmed animal; who argue that conservation should not be monetised in such a way; these are the very people who urge us to donate our own cash to their cause; in effect to pay their wages. How are they anything other than mercenaries? And how can they, who take their own salaries from your donations before a single penny goes to the cause they are espousing, be so dismissive of people who have worked their entire lives to save Africa’s wildlife and who have strived to do it in a way that is sustainable. These people regard the ‘sustainable’ as a dirty word, yet it is the only reliable long term option. If it is to survive, Africa’s conservation efforts must ultimately be sustainable (self-funding) rather than being dependent on the philanthropy of others in far away lands; Philanthropy that can be stopped on a whim. Another argument that is regularly trotted out is that “until we eliminate corruption”, legalizing the trade would be dangerous and open the way for contraband to enter the legal trade. Of course it will – to the extent that it is allowed to happen – but to suggest that we don’t try a legal trade in rhino horn to compete with the rampant illegal trade already in place until we have eliminated corruption is naïve in the extreme. Realistically we will never eliminate corruption. Police forces have been in place since societies began but we still live with corruption and crime. We all have to live with corruption because it is plainly and very simply a fact of life. Can you think of any other instance where we have said that we should not engage in legal trade until we have eliminated the illegal trade? I cannot. There are many commodities or products that are stolen and sold illegally – cars, cigarettes, designer clothing, alcohol, jewellery, TV’s, the list is endless. Money itself is stolen and laundered We don’t ban the sale of any of these products nor do we ban the use of money. Instead we develop ways of countering its illegal use; surely we can do the same with horn. If we accept corruption as being a valid reason for not trying legal trade – we might as well all give up and go home because corruption and crime are here to stay and there will always be criminals. It would be one hell of an indictment on all of us if we allow rhinos to go extinct without having tried everything possible to save them, including a legal trade in rhino horn. Behind this debate about the trade in rhino horn lies another, equally important, issue; self-determination. How long will it be before African countries are allowed to manage their own wildlife areas, as they wish, without interference and pressure from NGOs and foreign governments? How long will it be before countries that have all but wiped out their own wildlife cease thinking they have a right to tell Africans how to manage theirs? About 140 years ago, in the USA, native bison had all but been wiped out by buffalo hunters. Now, brought back from the brink of extinction, bison are farmed for their meat. How then, can the USA claim the moral high ground and argue against similar measure to prevent one of Africa’s iconic species going extinct? Going forward; unless we are content to let conservation – and by extension the enjoyment of wildlife in its natural habitat – evolve into the preserve of a wealthy elite a way must be found for the conservation of wildlife to be sustainable, and by sustainable I mean self-financing. It can be done. The vast majority of animals are not targeted by poachers for their meat or body parts and will happily exist in national parks or wildlife reserves that very closely resemble their natural habitat. I say ‘very closely resemble’ simply because the boundaries around national parks and wildlife reserves restrict the habitat in a way that is not natural. The vast majority of animals are not the problem; the problem lies with a few iconic species that are targeted by ruthless people – the poachers are just the tip of the iceberg; the visible part of a much larger organisation. Vast amounts of money are expended to try and protect these species across the continent of Africa, yet in only a very few cases can we say that the battle is being won. Some of this money comes from governments, some comes from philanthropy – large donations from wealthy individuals or an accumulation of small donations from concerned members of the public. It is not a secure source of finance and could easily be shut off on a whim. So why, when a way presents itself for the conservation of one of these iconic species to be sustainable – self-funding – is it so readily shouted down? Why, instead of celebrating the fact that, if properly managed and controlled, rhinos could be worth more alive than dead, are so many people and organisations that claim to be committed to saving this iconic Africa species fighting so hard to prevent it being allowed? The fact that rhino horn can be collected without the need to kill the animal should mean that ensuring their survival is a no-brainer. Can we really be so petty as to let Africa’s rhinos become extinct simply because we objected to the fact that someone might make money from selling the horns? As things stand, when those horns are poached and sold the money goes to greedy businessmen and the rhino is dead. Isn’t any solution that allows the rhino to live preferable to that?